Peter qualified at Bristol in 1972. He has been practising homeopathy for 30 years – at present he takes referrals at the Holistic Veterinary Mecdicine Centre in Sussex, and also from his home in Dorset. He lectures extensively in UK and overseas, and is a Fellow, and Veterinary Dean, of the Faculty of Homeopathy. 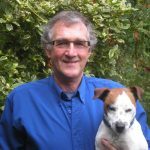 He has been teaching homeopathy to vets in UK and around the world for many years, is author of ‘Insights into Veterinary Homeopathy’, co-author of ‘Textbook of Veterinary Homeopathy’ and has contributed to several other publications.